La Paz, March 21 (Prensa Latina) Bolivia filed in today at the International Court of Justice in The Hague its reply to Chile in the case over its claim to have a sea outlet, in an environment warmed by the kidnapping of nine citizens of this country, at the hands of Chilean Carabiniers. 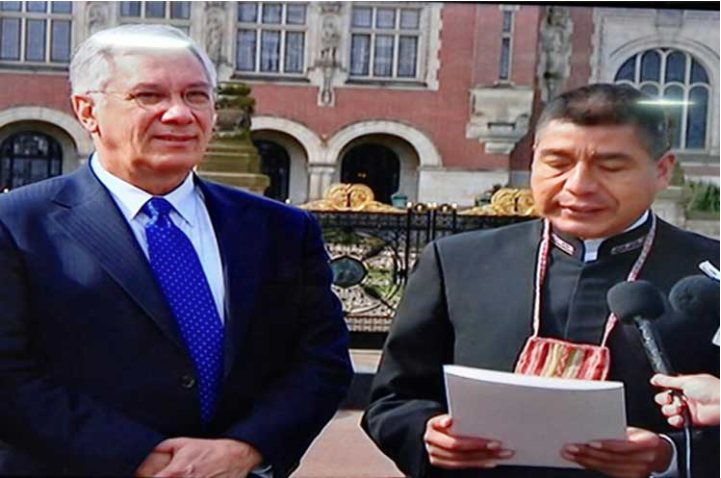 The reply was presented by the Bolivian representative to the ICJ, Eduardo Rodríguez Veltzé, who will be accompanied by Foreign Minister Fernando Huanacuni; the Minister of Justice, Héctor Arce, and the President of the Chamber of Deputies, Gabriela Montaño. Bolivia lost its way to the sea when in 1879 Chile invaded the country and snatched 400 kilometers of coast and 120 thousand square kilometers of territories rich in minerals. In 2013, Morales government decided to take the case to the ICJ and on September 24, 2015 that court declared itself competent to address the claim. The international court set March 21 for Bolivia to present its replica, while Chile has a deadline until September 21. The Bolivian replica contains arguments related to the lawsuit and incorporates annexes with documentary evidence, said Rodríguez Veltzé, although he avoided giving more details in compliance with the rules of the international court. Its presentation in The Hague comes at a time of new tensions between the two countries due to the incursion of Chilean gendarmes in Bolivian territory and the kidnapping of two soldiers and seven customs officers, according to authorities of La Paz. The Foreign Ministry summoned the Chilean consul general, Manuel Hinojosa, to protest that violation and demand the immediate release of the fellow nationals. Bolivia argues that the citizens were kidnapped in their territory when they persecuted smugglers, while the Chilean side says that the incident occurred under their jurisdiction. The Minister of the Presidency, René Martínez, described as utterly false the statements of President Michelle Bachelet that Bolivians entered Chile to steal. The group was detained in the police station of Colchane, from where it was transferred to the town of Pozo Almonte. This entry was posted in Bolivia, Social Unrest and tagged 1879 Pacific war, Chile, invasion. Bookmark the permalink.